San Francisco in the 1920s. The memories of the 1906 earthquake were as fresh as the memories of 9/11 are today. The city had rebuilt, and the United States was entering what would later be called the Age of Prosperity—or, more informally, the Roaring Twenties. The country shook off a postwar recession with a surge of manufacturing productivity, technological advances, and a stock market that seemed to be going nowhere but up. Much of my dad’s theatrical experience was in “light opera”—musical comedies by Gilbert and Sullivan and many far-less-famous composers. 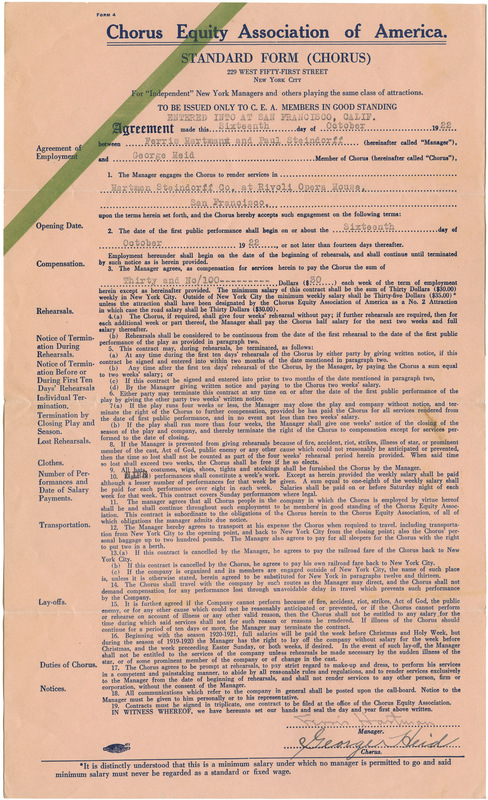 As the above contract shows, one of the first theater companies he joined was called the Hartman-Steindorff Opera Company. Both of the company’s founders have interesting stories. Ferris Hartman was an actor and silent film director. Paul Steindorff was a well-known conductor who moved to San Francisco in 1901 after a successful career on Broadway. As legend has it, when the 1906 earthquake struck, Hartman and Steindorff fled to Oakland in a hearse to get past military guards who were trying to stem the flow of refugees into Oakland. As for Ferris Hartman, he met a sad demise in 1931, collapsing from starvation in his San Francisco hotel, broke and alone. The news made the front page of the Oakland Tribune. (Click the image at right to read the article.) A benefit was hastily arranged, but he died before it took place. The show went on and drew an audience of thousands. At Hartman’s request, the proceeds went to charity. Ferris Hartman left behind several children, including a son, Paul Hartman, who performed alongside my dad in the senior Hartman’s acting company. He’s on the left in this 1922 photo; my dad is on the right. Paul Hartman went on to have a successful acting career in theater, film, and television. He and his wife Grace won Tony awards in the 40s and starred in one of the first TV sitcoms, 1949’s The Hartmans. In the 60s, he had recurring roles in The Andy Griffith Show and Petticoat Junction. My dad watched these shows in the basement game room of our house in Pittsburgh. I wonder if seeing his old acting buddy brought forth pangs of nostalgia and memories of a previous life.